A building’s structure is typically hidden away once the ‘skin’ goes on, just like the skeleton of a person. It’s fundamentally important to how a building stands up and takes the weight of the people and their goods down to the ground, even while the building is being pushed sideways by wind and earthquakes. 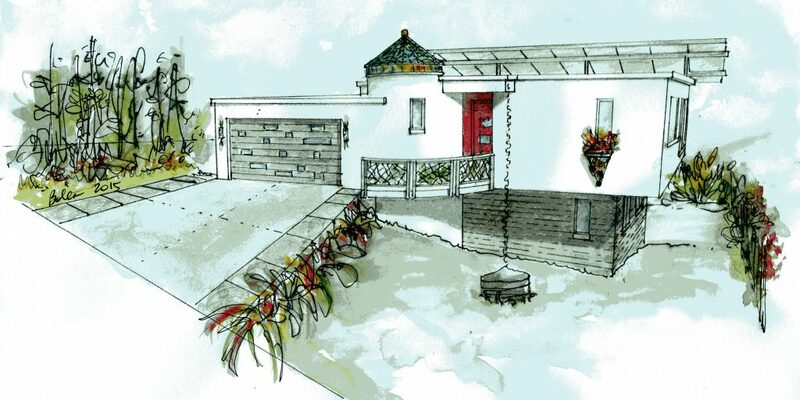 While we had dreams of breaking new ground with the structure of our house, the contractors we talked to, their pricing, the conservative nature of the construction industry and in some cases even our ‘green’ consultant team have pushed us towards building a (mostly) conventionally structured house. Conventional wood ‘stick’ framing, where each board and panel of the structure is cut and attached together one piece at a time on site, sitting on a massive concrete foundation, is what we ultimately decided to use. We’ve been a little disappointed with this, although it is worth pointing out that conventional stick framing has become so widespread for good reason. It easily accommodates a variety of designs, uses materials that can be manipulated by one or two people, easily allows for inclusion of electrical, plumbing and mechanical systems, and is understood by everyone in the construction industry. Aside from the foundations, most of the structural materials are sustainable: wood, which is carbon neutral or negative, along with a sprinkling of recycled or recyclable steel. A small team can erect a wood frame structure of a house in a few weeks, originally with hand tools, now with hand-held power tools. Other options we examined included panelized construction, where sections of wood framed walls are built in a factory and bolted together on site; modular construction, where entire houses or sections of houses are factory made and brought to site all-but complete; SIPS framing, where the walls are foam-filled panels that are both structure, insulation and sheathing. There is also rammed earth construction, where soil is used to create walls, EFS block construction, where foam blocks are used as concrete forms and then serve as insulation, even straw bale construction, where agricultural waste becomes structural walls. Our research with vendors of these systems and contractors who have used them convinced us they weren’t for us. Too costly, not flexible enough to accommodate on-site imperfections, not suitable for our hillside site, and, in the case of factory made housing, leaving we architects with nothing fun to do! So, the structure of ou r house, just starting to be framed, consists of the usual things; floor joists, framed walls with horizontal 2×6 ‘plates’ at the top and bottom and vertical studs between them, rafters on top, with everything sheathed with plywood. But there are a few distinct things. 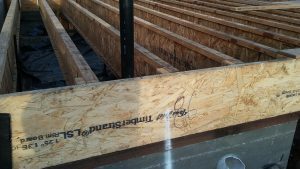 All of the joists and rafters, which historically have been solid 2x lumber, are more modern artificial ‘I’ beams, called TrusJoists or TJI’s. They’re made of glued-up wood wafers, in a structurally efficient shape similar to a steel I beam. They are light, strong, dimensionally stable (solid wood will shrink and expand with its moisture content), and made from fast-growth, small trees. Other heavier beams are also artificial lumber – Timberstrand beams — also made with glued-up wood wafers. Probably not as sustainable as solid wood, however, as the glue may not be particularly recyclable. But hopefully durable and maybe less prone to termite attack. The walls were meant to be framed using ‘advanced framing’ techniques. In advanced framing, the spacing of studs is maximized and the number of studs at corners and intersections is minimized to reduce cost and increase insulation areas – studs conduct heat more readily than insulation does. Top plates, which are usually doubled up so that joints can overlap, are made singular with strapping across the joints. And the lengths of walls and location and size of window and door openings are optimized to minimize cutting of plywood sheathing. Unfortunately, our structural engineer, Bruce King, and our green building adviser, Katy Hollbacher of Beyond Efficiency, who is a structural engineer herself, disagreed about whether advanced framing was a good idea for our project. Bruce argued that our hillside site, just a mile from the San Andreas Fault, needed the strength of studs at 16” on center instead of the ‘advanced’ dimension of 24” on center. Bruce won as he has official responsibility for the structure. We decided we could at least have a single top plate, as it could be made from a continuous piece of Timberstrand lumber. Our contractors, however have convinced us to use conventional double top plates, which allows them to buy standard pre-cut studs. Same material cost but less labor. We also didn’t make much effort to keep doors and windows to standard advanced framing dimensions – there are too many reasons to center windows in irregularly shaped rooms and use manufacturer’s standard sizes. But what about using sustainable lumber? Our specifications noted that framing lumber should be FSC certified. FSC (Forest Stewardship Council) lumber is harvested sustainably using good forestry practices. Unfortunately, the lumberyard giving us a quote missed that requirement, their pricing got built into our budget (now tighter than a miser’s purse strings) and we have now acquiesced to using regular lumber. FSC lumber for our project worked out to be 47% higher in cost. In addition, as local lumber yards are not stocking the material, it had a six week lead time, which we also could not afford to absorb in the schedule. So, amid all of these minor disappointments, what is cool about the structure of our project? Cantilevers are when a beam extends out beyond its support, like a diving board or the eave of a roof. Frank Lloyd Wright, my favorite architect, made extra wide cantilevers a hallmark of his work; they later became a hallmark of modern architecture. Cantilevers can make buildings seem to soar towards the horizon. In our project, the second floor cantilevers out past the first floor by a good four feet; the solar array cantilevers out past the roof; the deck cantilevers out past its support beam. No buttresses — those add-on braces that Gothic builders used to keep their vaults from collapsing — just soaring structure. 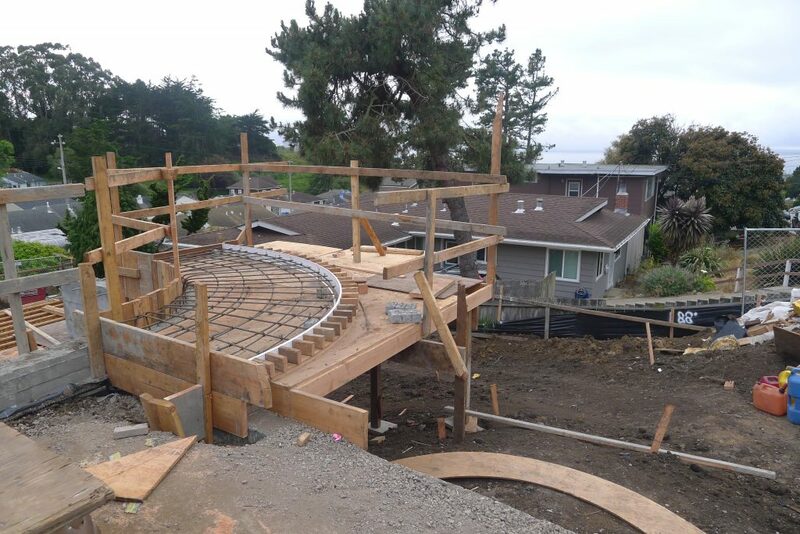 This Friday, the cantilevered concrete walkway that leads to our front door is being poured. It extends four feet out from its supporting wall; its edge supports the guardrail which cantilevers another four feet upwards. There is a story, perhaps apocryphal, that when the form boards were ready to be removed under Fallingwater’s mighty cantilevers, the contractor refused to do it, and Frank Lloyd Wright manfully took a sledge and pounded them away while standing underneath.